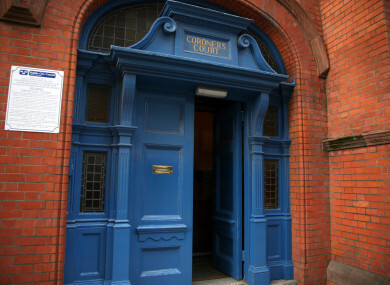 THE INTENDED TARGET of a gunman was running for his life when the attacker opened fire and shot the wrong man, Dublin Coroner’s Court has heard. Martin O’Rourke (24) sustained a fatal gunshot wound to the back of the head as he crossed the street at lunchtime on 14 April 2016. A witness described seeing the gunman arrive at Sheriff Street, Dublin 1 at 12.25pm where a crowd was gathered outside Noctor’s pub. Shouts rang out to alert the intended target as the gunman took the weapon from his pocket. Dublin Coroner’s Court heard that the gunman’s target began to run for his life and as he did so, the assailant discharged a total of 13 shots. The target passed close by Martin O’Rourke, who was struck by a stray bullet. He suffered extensive brain damage and collapsed onto the road. Relatives of O’Rourke’s partner Angeline Power gave evidence at the inquest. Her father Laurence Power paid tribute to gardaí. “I want to thank the gardaí for everything they have put into this. To be honest, I’d prefer Martin to be where he is now,” Power said. He spoke to O’Rourke shortly before he was killed. “He said he was going to Sheriff Street. He was asking about the kids,” Power said. They made arrangements to meet at lunchtime but O’Rourke did not appear. Power made calls to his phone but these went unanswered. “I wasn’t sure what happened. I actually walked down to Sheriff Street but I didn’t know it was him that had been shot,” Power said. Ellen Power, a sister of Angeline Power, met O’Rourke in the city the morning of his death. “He thanked me for minding the kids. He gave me a hug and said he loved me and that was the last time I saw him,” she said. Witness Killian D’Arcy was sitting in his car when the gunman arrived at Sheriff Street on a bike. “He cycled real slow. He took a handgun from his right pocket. He fell off the bike. When he came off the bike the intended target ran. The fella who was shooting went into the road… he stood in the street shooting towards Noctor’s pub,” he said. Witness Geraldine Brennan said she heard a number of shots and saw the gunman on the street with his arm outstretched. “I saw him trotting. It wasn’t a run. He was firing a gun as he went. It was definitely a lot of shots. I stopped counting at 12 shots,” she said. Detective Inspector Shay Dalton said the gunman’s target fled as others shouted to warn him. “The assailant fired a total of 13 shots in the direction of the fleeing target. Martin O’Rourke was making his way from Sheriff Street towards Oriel Street. Tragically at the corner he became caught in the crossfire,” Dalton said. O’Rourke collapsed onto the street and was unresponsive as gardaí arrived and began chest compressions. He was rushed to the Mater Hospital where he was pronounced dead. State Pathologist Professor Marie Cassidy conducted a postmortem. The cause of death was a single gunshot wound that penetrated the back of O’Rourke’s head causing extensive brain injuries and rapid death. Gardaí followed 657 lines of inquiry, collected 281 statements and made three arrests as part of a comprehensive investigation. A file was submitted to the Director of Public Prosecution but no charges were brought. “Tragically Mr O’Rourke was just in the wrong position,” coroner Dr Myra Cullinane said and offered condolences to O’Rourke’s extended family and to his children. Email “Innocent shooting victim Martin O'Rourke 'caught in crossfire', inquest hears ”. Feedback on “Innocent shooting victim Martin O'Rourke 'caught in crossfire', inquest hears ”.